Carly McGuinness, Louise Gaskin, Samantha Henshaw, Sarah Barker, Victoria Turner, and Viv Lines qualified for the Horse of the Year Show (HOYS) at the SEIB Insurance Broker’s Search for a Star and Racehorse to Riding Horse 2016 qualifier held at Bury Farm Equestrian Centre in Slapton, Buckinghamshire on 3rd July. 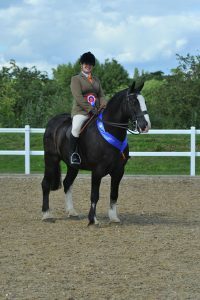 Carly McGuinness, 32, from Macclesfield won the cob class aboard her own Cobra. Imported from Reid Finlay in Ireland eight years ago, the black gelding was intended for riding club activities. Carly has been persuaded to do more with Cobra by friend, colleague, groom, and prosecco-provider Lucy Penrose. Together, they made the three-and-a-half-hour journey to Bury Farm. The pair will now contend some open classes and concentrate on preparing for the final. “It’s a good job I booked our holiday for the week after HOYS!” she laughs. 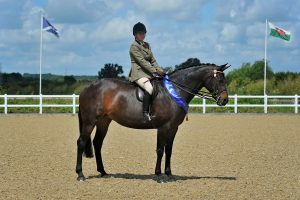 Louise Gaskin, 32, from Swanwick, came in second in the cob class aboard her own Ranchella Rolex, securing her ticket to HOYS. Louise, who breeds rare coloured French bulldogs, had gone to try ‘Roly’ as a happy hacker for her mum, but saw his potential as a show cob and decided to buy him for herself. Samantha Henshaw, 46, from Macclesfield, came second in the strong riding horse hack class with her eight-year-old mare, Trevisquite. Samantha bought the bay mare from an eventing yard two years ago, and intended to focus on dressage with her. 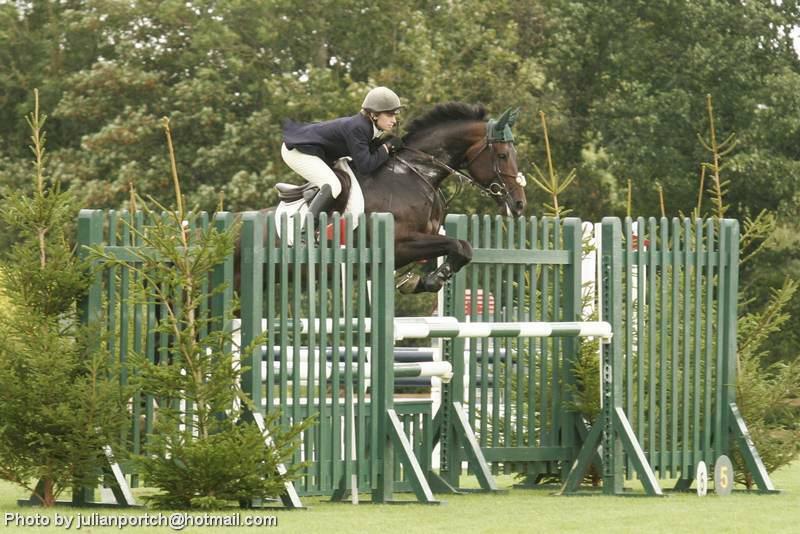 “She was not keen to go cross country, and I wanted something to do dressage. She is bred to do dressage, and is by the stallion, Sandreo, and at competitions people suggested that we should also try showing,” she explains. “We did two SFAS qualifiers last year, but she wasn’t in a double and it has taken a while for her to get used to it.” The pair contested Houghton Hall, placing 5th, before coming to Bury Farm. Samantha has taken some words of advice from an interview with a football manager, and refers back to them when working with her talented but opinionated mare. “He said you have to keep trying, and don’t be afraid of failure. Just give your best. We did, and it has paid off,” she laughs. Samantha’s groom for the day was friend Nancy Hofton, who learned to do quarter marks so that ‘Chockie’ would look her best. Sarah Barker, 17, from Manchester, took second place in the pony class with her Tideline Rainbow King. Sarah bought the Welsh Section D gelding, known as Romeo, as a 20-month-old, and has brought him along herself. Victoria Turner, 17, from Skirlaugh, rode her mother Claire Turner’s Rubiks Cube to a respectable second-place finish in the well-attended riding club show horse class. Victoria bought Rubiks Cube when the mare was a just-backed three-year-old, and initially struggled to make the leap from her prior schoolmaster pony, coming off at a show. “This just made me all the more determined to succeed,” says Victoria, whose tenacity has paid off. A member of the Holderness Pony Club, she attended camp that year and the instructor suggested that she should get dressage lessons with Joanne Wilson. “She is just amazing, and I would never have got this far without her,” says Victoria, who has had weekly lessons with Joanne since then. Victoria and Rubiks Cube competed in the Pony Club Winter Championships and SEIB Trailblazers Championships in 2015, and came 3rd overall and 4th in the team competition at the Pony Club area dressage at Harrogate the day before their Search for a Star bid at Bury Farm. They have also qualified for the SEIB Trailblazers Championships again this year. 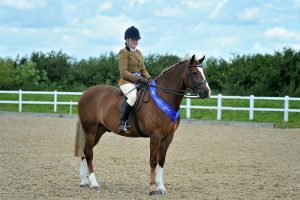 Viv Lines from Liverpool booked her ticket to HOYS with a second-place finish in the working hunter class aboard the simply-named M, who she had originally intended to event. “She just grew, and I’m not sure she’s the right stamp for eventing,” she explains. “We decided to do some showjumping and have a go at showing. We only decided to come to Search for a Star at the last minute!” The decision – and 3am start – paid off for the pair, who also showed at Osbaldeston SFAS for the experience. “We did Osbaldeston and really enjoyed it, but she had only recently started jumping,” explains Viv, who had a 4-year break from riding while she worked in France. “It is great to be back in the horse world.” Viv now works part time for the BHS as an inspector, visiting riding schools and yards. She also has another horse that she competes in eventing. “M is being loaned to the Pony Club for the Area Dressage. It just helps to put more miles on the clock,” she explains. 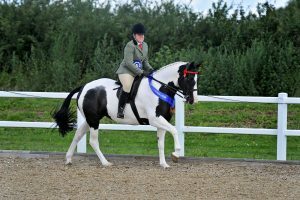 The SEIB Search for a Star series has been created by SEIB to encourage amateur riders to produce their horses to a high standard in the show ring and giving them the opportunity to compete at the prestigious finals at the Horse of The Year Show (HOYS). Each qualifying competition follows the same format, with classes for Working Hunters, Riding Club Show Horses, Show Hunters, Show Ponies & Show Hunter Ponies, Riding Horse/Hacks and Cobs. 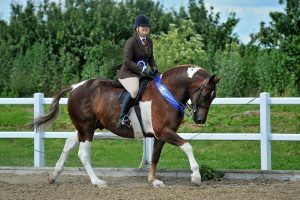 “The Search For A Star Championship series is a way to give amateur riders the chance to achieve their dream of riding at The Horse Of The Year Show. The standard increases every year and we are delighted to give so many riders this opportunity,” said Nicolina MacKenzie, Marketing Manager at SEIB Insurance Brokers. The riders will compete at the SEIB Insurance Brokers Search for a Star and Racehorse to Riding Horse Championship finals at the Horse of The Year Show, 5th – 9th October 2016, at the Birmingham NEC. More information on the Search for a Star series is available at www.search4astar.org.uk, and regular updates on the series can be found on social media at www.facebook.com/SEIB.Search4AStar. The SEIB Racehorse To Riding Horse Show Championship was created by South Essex Insurance Brokers to support and encourage the re-education of thoroughbreds taken out of racing, re-schooling them and preparing them for a new career in the show ring. The series offers 6 qualifiers throughout the country, with winners earning a coveted ticket to the SEIB championship held at Horse of the Year Show. The classes are open to both amateur and professional producers and are judged as for Riding Horses, with the best of type, whether hack, riding horse or hunter, deemed the winner. 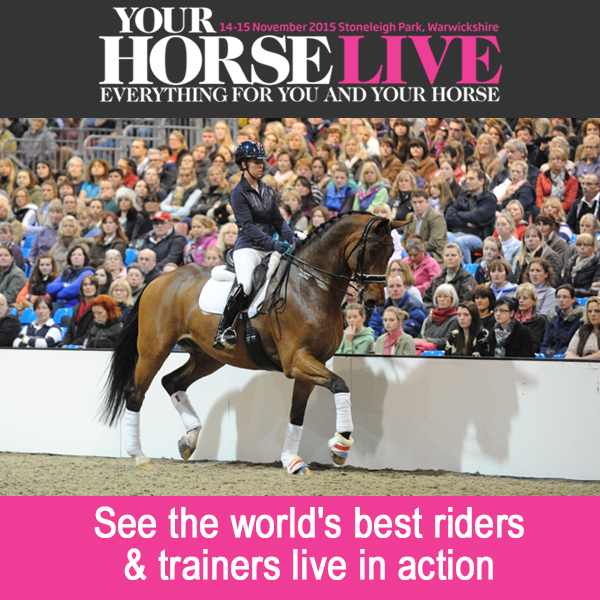 Have you got your ticket yet to the UK’s largest equine shopping event – Your Horse Live?